Your dog may have been diagnosed with “IVDD” if he has back or neck pain with or without difficulty walking. Severely-affected dogs may be unable to walk at all. Treatment is surgical or non-surgical. Intervertebral disc disease (IVDD) is an umbrella term that is used by many clinicians, dog owners and breeders. IVDD includes disc degeneration, any type of herniation that this may cause, and all the pain and other problems caused by this. disc “bulge”, in which the outer fibrous part of the disc hypertrophies (becomes over-developed) making the disc bulge outward a little. Above: an MRI scan of a dog’s spine. The spinal cord is the long structure marked by an asterisk. The disc extrusion is marked by a white arrowhead. 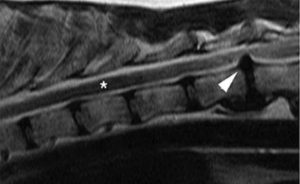 In this case the disc extrusion is squashing or compressing the spinal cord. Many thanks to Canada West Veterinary Specialists for the use of this image. Some breeds of dog are “chondrodystrophic”, e.g. the dachshund, beagle, Pekingese, French bulldog, miniature schnauzer and cavalier King Charles spaniel. This means that their cartilage develops differently to that of other dogs. In these chondrodystrophic dogs, discs degenerate while the dog is still young, i.e. the centres of the discs harden and may calcify. This hardening of the discs doesn’t itself cause the dog any pain or clinical signs but can eventually cause the disc to herniate. These breeds of dog have increased chances of getting disc extrusion, though protrusion and bulge may also occur. 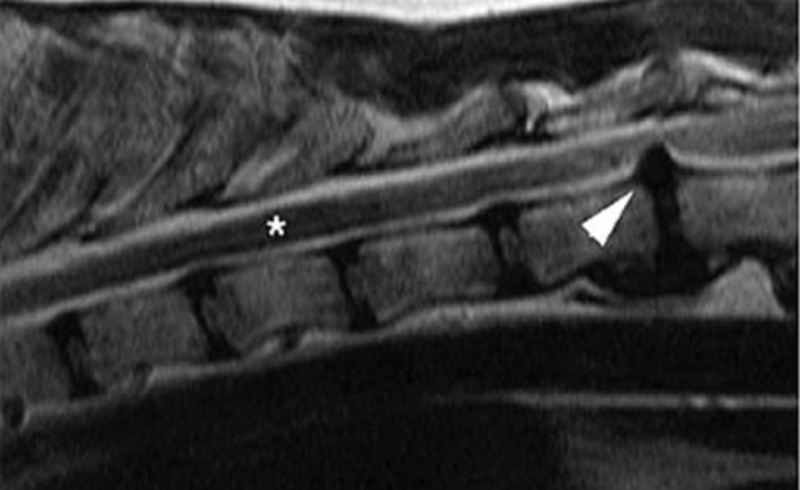 Breeds of dog that are not chondrodystrophic tend to get disc protrusion or disc bulge (both of these are Hanson Type 2 herniation) rather than disc extrusion (Hanson Type 1 herniation). These dogs, e.g. Labradors and German Shepherd dogs, tend to get the problem later in life once discs have degenerated over some years. IVDD is a painful condition. Dogs who have a mild (grade 1) version of the condition are able to walk normally, but may show one or more signs of pain as listed below. Some of the signs listed above can be easily confused with those caused by a gastric upset, cystitis, pancreatitis or other problems. It’s important that your vet checks your dog carefully as these dogs can be tricky to diagnose correctly. Dogs with a gastric upset certainly won’t want to be sent to a neurologist for spinal imaging. 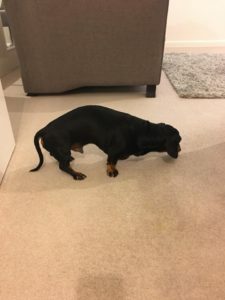 However, to be on the safe side, if there is a possibility of pain being due to IVDD then it is sensible to avoid running and jumping until your vet gives you the all-clear. In addition to signs of pain, more severely-affected dogs also have difficulty walking. It is most common for only the rear end of the dog to be affected in short-legged breeds such as dachshunds, i.e. the front legs work normally but the hind legs are weak or paralysed. Your dog may walk with a staggering gait rather like a drunken sailor, and he may cross his paws over or place them upside-down at times. Some dogs are unable to walk at all, but may try to pull themselves along with the front legs while dragging the rear end along behind. Above: Standing posture often seen in IVDD-affected dogs. Thanks to Claire Murphy for this picture of her dog Jakes. Above: This video shows Sybil when she had a painful back. Thanks to M.Lucas for sharing this video. Above: Ernie with quite a wobbly (ataxic) walk. Thanks to E.Brechin for sharing this video.